Oaks: Did not serve a mission. 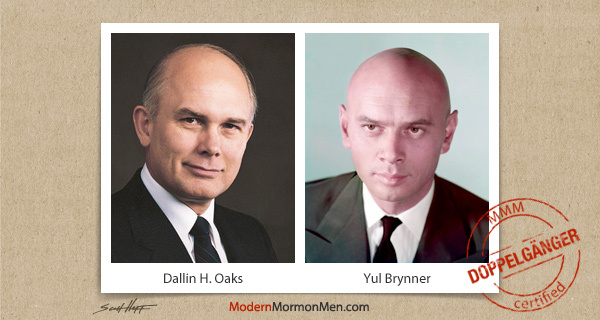 Brynner: Did not serve a mission. Brynner: Always prepared breakfast while wearing a silk kimono. Oaks: Always prepares breakfast while wearing a suit (rumored). Brynner: "Don't smoke, whatever you do, just don't smoke. If I could take back that smoking, we wouldn't be talking about any cancer. I'm convinced of that." Oaks: "The revelation that commands modern Saints to refrain from alcohol, tobacco, hot drinks, and other harmful things promises the faithful that 'the destroying angel shall pass by them.'" Brynner: He was good friends with Frank Sinatra. Oaks: Good friends with Jeffery R. Holland. Brynner: Was in The Ten Commandments. Oaks: Keeps the Ten Commandments. Oaks: Probably enjoys that movie. Oaks: Founding member of the editorial board of Dialogue: A Journal of Mormon Thought. Brynner: Never even heard of Dialogue. Brynner: Stan Lee used his physical likeness (noticeably his bald head and intense stare) as the inspiration for the appearance of Professor Charles Xavier in the X-Men comics. 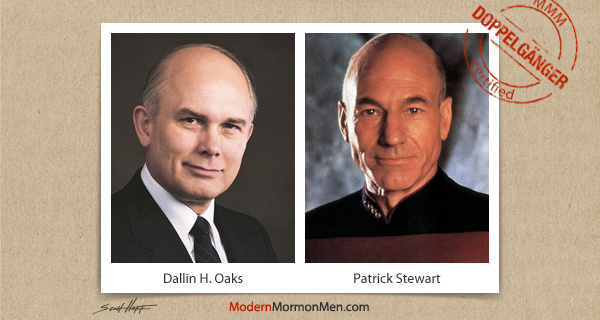 Oaks: Elder Oaks' runner up doppelgänger is Patrick Stewart, who played Professor Charles Xavier in the X-Men films.